We supply the canvas. You choose the colour! No more compromise! Hamilton’s range of paintable plates offers a colour-match made in interior heaven. Plates can be supplied pre-painted to match any wall colours from the Dulux range, or to replicate the finer tones used in your soft furnishings. And in case you prefer to apply the colour yourself onsite, plates are also available in a ready-to-paint primed finish. So, whether your desired look is to ‘blend in’ and disappear, or to be an eye-catching feature, Hamilton has it covered. 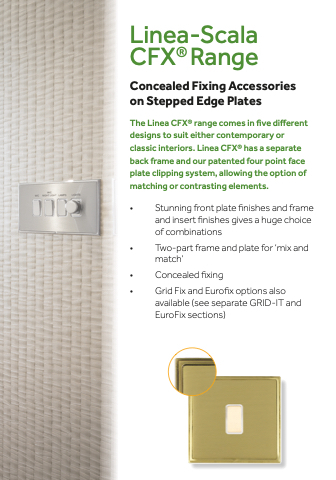 Hamilton’s paintable range is available using the Hartland CFX® and Sheer CFX® designer collections, with a choice of insert finishes from bright chrome to antique brass, and with either black or white insert surrounds.